This report allows you to see how many Medicare patients your competitors are getting. With the constant improvement in technology and data collection, the LTC industry is getting smarter by the minute. Using data, new facilities are opening and providing services most required in the marketplace. SNFs are able to pinpoint which case managers and physicians would be most beneficial to develop/enhance relationships with in order to increase referrals. With the right data, marketing strategies can be developed based on the demographics of the service area. Consistently improving and upgrading based upon actual data is essential to the continued success of any long term care facility. 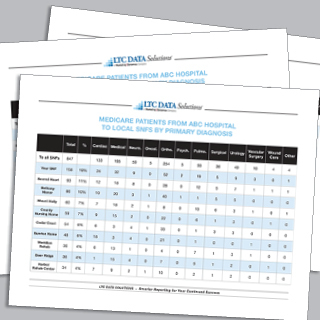 LTC Data Solutions provides key reports facilities need to make informed decisions and to keep up with changes in the marketplace.